Back in September, the hot topic between my friend and I was the new Woodward book about Trump. I mean, COME ON! Woodward authored All The President’s Men. This man knows how to get to the root of the truth. So I ordered the hardback and in the process E decides she would listen to it on Amazons audible. Well, I had never heard of Amazon audible nor had I ever “listened” to a book. Audiobooks always seemed a bit expensive and time consuming. But I thought, what the heck, let’s give it a try! $14.99/month gives you one credit for any book of your choice and two credits of Audible Originals (which are solid reads as well). You do not have to read them in a certain timeframe or order. I now have a digital library of multiple books that I am ploughing my way through. This audible was narrated by Robert Petkoff (who appears to have an iMDB page complete with various acting gigs). In pulling up his author’s page on audible, I see that he has no less than 199 entries. So, I am assuming he is a sought after narrator. His voice was even toned and allowed me to passively listen while working on other things. I am glad that I listened to this book on audible because I am not certain that I could have made my way through actually reading it. The content horrified me for the most part. The subject matter reinforced how I already viewed the current administration. Two words came to mind: uncontrolled chaos. My level of frustration while listening to this book leads me to believe I would have sat it down, like I did when reading The Exorcist. I would have never returned to it and then later, once I heard what the story was really about, would burn it – also like The Exorcist. Because I have waited so long to write this blog (shame Shame SHAME!! ), I cannot get it clear in my mind which details I think of came from the book and which have played out in the public theater during the time of this sitting president. 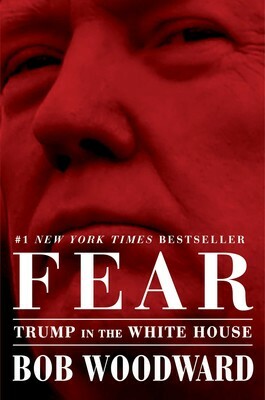 I will not write about the book content other than to say it terrified the crap out of me that the White House could seem to be on the brink of implosion at every moment of every day regarding every topic. Regarding audible: I love it – I am reading the fourth book since Fear. I will be more consistent with my blogging of those books. I am in the middle of a four book series (Wicked) which I will put together in a single blog once finished.